Former U.S. Ambassador to the United Nations John Bolton delivers a clear — and dire — message in a Newsmax magazine special report: Iran's quest for nuclear weapons poses a grave and immediate threat to the United States and world peace. 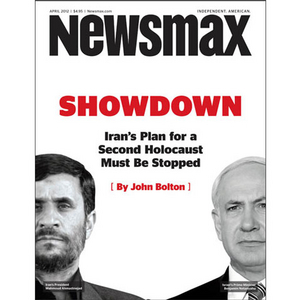 And in his exclusive Newsmax article "Showdown," Bolton declares: "Iran's plan for a second Holocaust must be stopped." Bolton cites Secretary of Defense Leon Panetta's assertion that Tehran could fabricate a nuclear weapon "within about a year" — and warns that many analysts believe it could come sooner. Time is running out for both Israel and the United States. Bolton argues that either or both must launch a pre-emptive strike to stop Tehran. But such action will stretch Israel's military capabilities to the hilt and might expose Americans to a new wave of terrorist attacks. Fred Fleitz, a former CIA analyst and senior House Intelligence Committee staff member and current managing editor of LIGNET.com, offers an in-depth look at Iran's uranium-enrichment and weapons-development programs. Famed Harvard law professor and trial attorney Alan Dershowitz writes that any attack by Iranian agents against American citizens or U.S.-based foreign embassies must be deemed an act of war by Iran against the United States. Pulitzer Prize-winning investigative reporter Judith Miller's Newsmax interview with the Sultan of Oman, the discreet intermediary between Washington and Tehran. This issue of Newsmax magazine gives one of the most penetrating reports on one of the biggest stories of our time. Why the State Department's approach to Iran is "flatly wrong"
Allowing "peaceful" nuclear program is a "fool's paradise"
Drones now flying surveillance in U.S.
Is the White House trying to silence conservative media? Are celebrity food products worth the money? 'Showdown' Newsmax Magazine April 2012 Former U.S. Ambassador to the United Nations John Bolton delivers a clear — and dire — message in a Newsmax magazine special report: Iran's quest for nuclear weapons poses a grave and immediate threat to the United States and world peace.